Following on from the widely successful first volume, this second edition has been updated and expanded to create an essential collection of writings examining different aspects of the history of books and print culture. examines different aspects of book history including: the development of the book, spoken words to written texts, the commodifcation of books, and the power and profile of readers. This pioneering book is a vital resource for all those involved in publishing studies, library studies, book history and also those studying English literature, cultural studies, sociology and history. 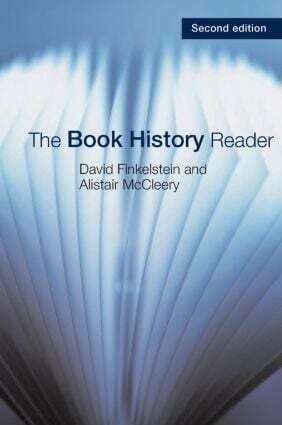 David Finkelstein is Research Professor of Media and Print Culture at Queen Margaret University, Edinburgh. He is author of The House of Blackwood: Author–Publisher Relations in the Victorian Era and co-author (with Alistair McCleery) of An Introduction to Book History. Alistair McCleery is Professor of Literature and Culture at Napier University, Edinburgh, and Director of the Scottish Centre for the Book. He is co-editor of The Bibliotheck.